Indoor skiing in Japan has seen better days: once thriving in Japan with slopes set up within driving distance of downtown Tokyo, the number of resorts has dwindled to a mere handful in the last decade. But with the surviving indoor ski joints, there’s still plenty of fun to be had for those that crave a quick getaway to the slopes without worrying about shinkansen and accommodation fees, or having taking a few days off from work. 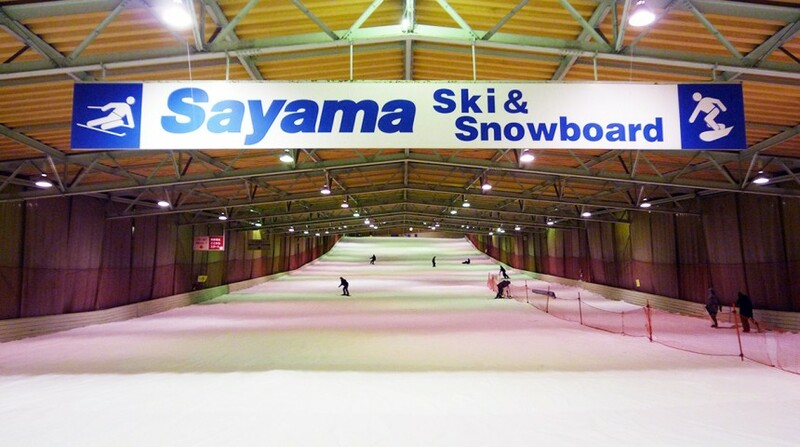 The Sayama Ski Resort is conveniently tucked away in Saitama Prefecture—a mere 40-minute train ride from Ikebukuro, 60 from Shinjuku—and houses a very lengthy indoor ski slope that measures at 300 meters long. While the slopes are generally open from 10am to 9pm, the resort has days where it’s available for all-nighters, open from 10pm to 6am—just in time to make it back for breakfast in Tokyo. Check with the resort or their website for schedules. Ski and snowboarding gear and wear available for rent. Lessons available (in Japanese only). Four-hour pass: adults ¥3,100; high school and up, and senior citizens ¥2,600; elementary and under free. Six-hour pass: adults ¥3,700; high school and up, and senior citizens ¥3,100; elementary and under free. One-day tickets: adults ¥4,100; high school and up, and senior citizens ¥3,300; elementary and under free. One of the most accessible indoor slopes for Tokyoites, Snova Shin-Yokohama is frequented in the summer by those looking to practice their ski or snowboard game off-season. Its 60-meter-long, 10-14-degree incline slopes are smooth, with one area outfitted with bumps and moguls; there’s also a half pipe slope for more advanced skiiers and snowboarders. Ski and snowboarding gear and wear available for rent. Lessons available. 120-minute pass: Adults ¥3,000-¥3,500; children ¥2,500-¥3,500. 240-minute pass: adults ¥3,700-¥4,200; children ¥3,000-¥3,700. Snova’s location in nearby Kawasaki caters well to skiers and snowboarders of all levels. Its 60-meter, 11-14-degree incline slope is decked out with walls, boxes, rails, and jumps—and of course a plain section for those that just want to experience the thrill of blazing through snow. Ski and snowboarding gear and wear available for rent. Lessons available (in Japanese only). Two-hour pass: adults ¥2,650-¥3,150; children ¥2,100-¥2,650. Four-hour pass: adults ¥3,700-¥4,200; children ¥2,950-¥3,700.